As of Weds, Oct. 26th, Third Avenue is open to vehicles and pedestrians. Thanks to a grant from the Department of Ecology, the City was able to install new utilities, sidewalks and pervious pavement along the edges of the roadway to intercept stormwater runoff from the road and sidewalks. A sand filter was installed below the pavement to treat the stormwater. This new pavement technology is a great example of low impact development, which helps keep toxins from our streets from entering our water supply. Main Street between First Avenue and Third Avenue will be closed Saturday from 3pm to 5pm for Downtown Trick or Treat. 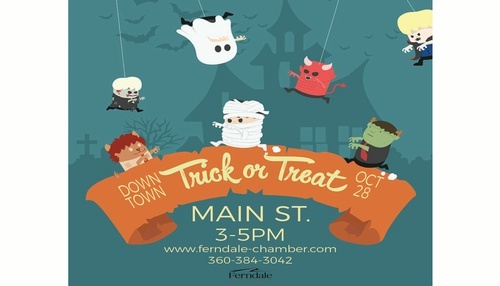 Each year over 2,500 children and their parents hit the streets of Downtown Ferndale in search of candy as part of this event with over forty local businesses participating. 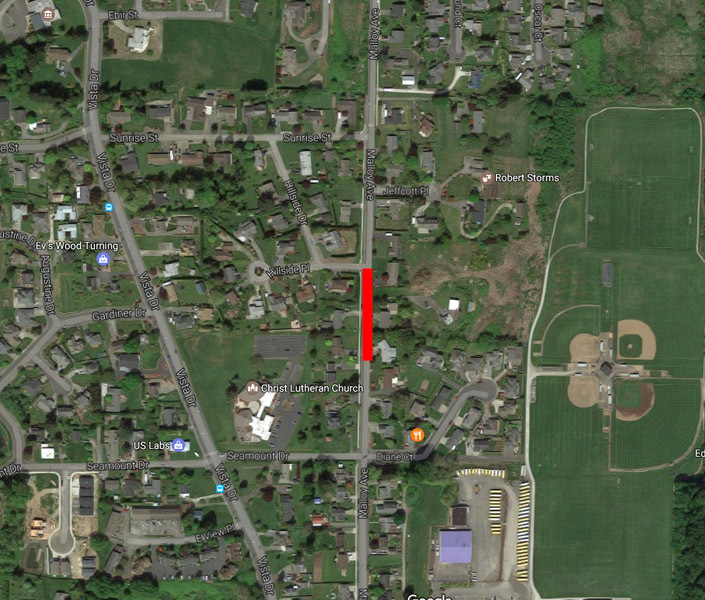 Traffic will be detoured on Alder Street but plan on alternate routes if possible. The event is organized by the Ferndale Chamber of Commerce. After Downtown Trick or Treat, head over to Pioneer Park for “Haunt the Park” starting at 5pm, a spooky experience for all ages. Want to help your family, school, and community be prepared for any emergency or natural disaster? The Ferndale Police Department is partnering with the Ferndale Emergency Resource Network to form a Youth Emergency Services (YES) Club for teens, ages 14-18, living in the Ferndale School District. Youth Emergency Services Club members can earn their amateur radio license, train to be part of the Ferndale Community Emergency Response Team (CERT), learn about disaster preparedness and response, and complete FEMA courses to prepare them to volunteer in an Emergency Operations Center. The Youth Emergency Services Club will hold its first meeting on September 30 from 10 – 11 AM in the Ferndale Emergency Operations Center at the Ferndale Police Department, 2220 Main Street. Join NFL kicker Michael Koenen, quarterback Jack Locker and Mayor Jon Mutchler for the kickoff of Ferndale Fit, a community run/walk/jog starting 5:30pm on May 24th at The Locker Room. Ferndale Fit is a weekly all-paces run/walk/jog each Wednesday, starting and ending at the Locker Room at 1858 Main Street. Families and strollers are welcome. The weekly event is designed to promote healthy living and community. Participants begin at the Locker Room and head out along the Hovander Park trail for 20 minutes, then return. The May 24th kickoff for this season begins with a short safety talk from Sergeant Claudia Murphy, a veteran officer of the Bellingham Police Department and avid runner. Light healthy refreshments will be provided following the run/walk by Burk Ridge Farms and the Locker Room. Ferndale Fit was started by Mayor Mutchler to promote healthy living and community building. For more information, call 685-2350. Thursday April 27th, Friday April 28th and Monday May 1st 8:30am-5:00pm. Work will take place on Malloy Ave and Maria Terrace. While the road will remain open, traffic control and speed reduction devices will be in place. This work is weather dependent with dates subject to change. This traffic revision is necessary to allow for a private developer to complete installation of a utility and storm crossing. If you have questions regarding this notice, please contact the Ferndale Public Works Department at (360) 384-4006. 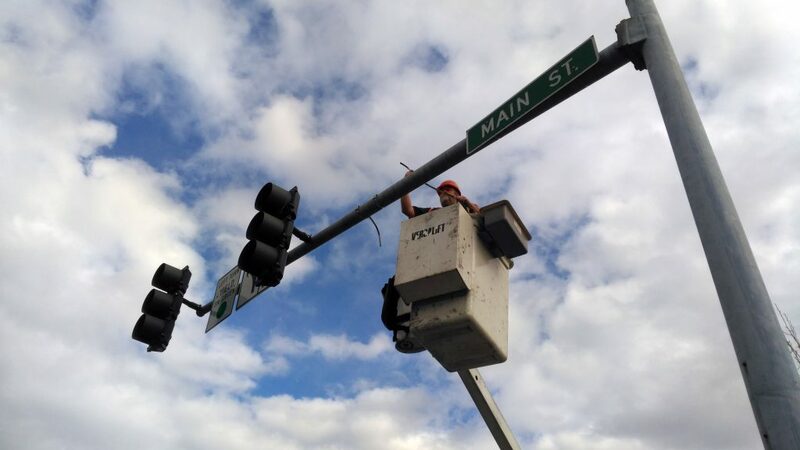 Traffic Signal Changed at 1st Ave. and Main St.
As part of the City’s efforts to improve traffic flow through our downtown core, the traffic signals at 1st Avenue and Main St have been changed. For traffic going East/West on Main Street, the signal will show a flashing yellow. This means proceed with caution. For traffic on 1st avenue, the signal will show a flashing red. This means come to a complete stop then proceed when safe. There will no longer be a protected pedestrian crossing at this intersection. The City will study the impacts to our city and review whether to remove the street light entirely. For any questions, please contact Ferndale Public Works Department at (360) 685-2379. The Parks, Recreation, and Trails Advisory Board is holding a volunteer clean up day at Flair Park on Saturday May 13th at 10am. Participants will be weeding, cleaning and improving the park in the first of a series of volunteer events focused on our smaller neighborhood parks located throughout the city. Volunteers are invited to bring their own gloves. Flair Park is located at 5610 Poplar Drive. The 0.9-acre park was renovated in 2001 and has a half basketball court; children’s play equipment, open grassy areas and picnic tables. 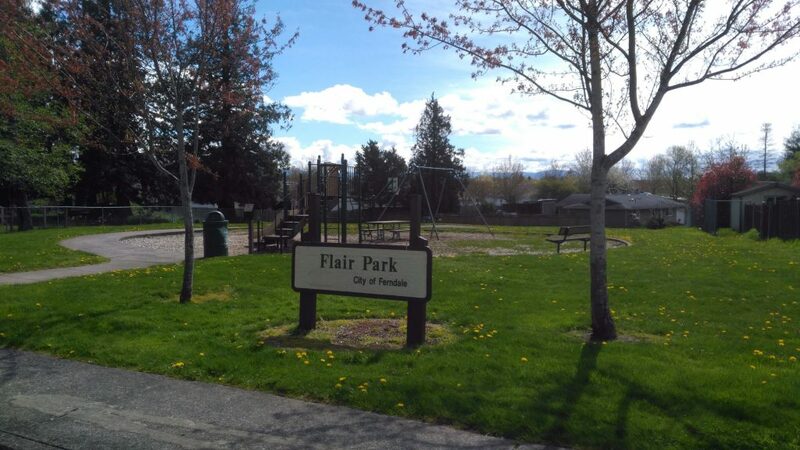 Flair Park was dedicated to the City in February 1971. This is a separate event from the City-Wide Clean Up Day, which is May 20th and organized by the Ferndale Downtown Association. For any questions, please call Riley Sweeney, Communications Officer at (360) 685-2353.